Hi loves! 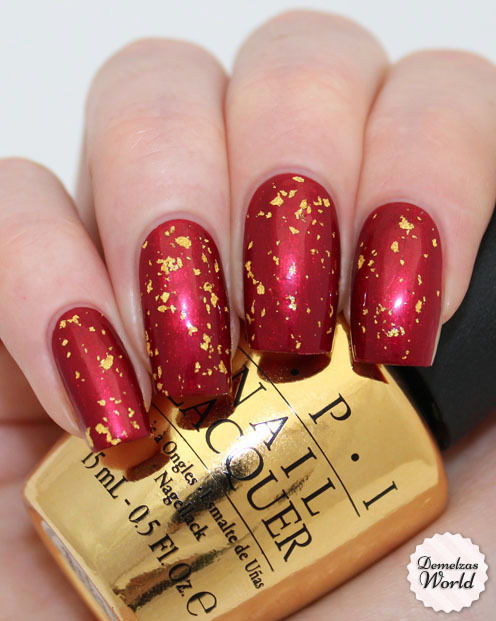 How could I not have reviewed OPI – The Man With The Golden Gun yet? I know I’ve made the video but I noticed that I don’t have any pictures on my blog and IT’S SO FREAKING PRETTY! I am in love 😀 This polish is definitely in my top 10 favorite polishes of all time … and I should be considered I payed 40 euro’s for it *sigh*. 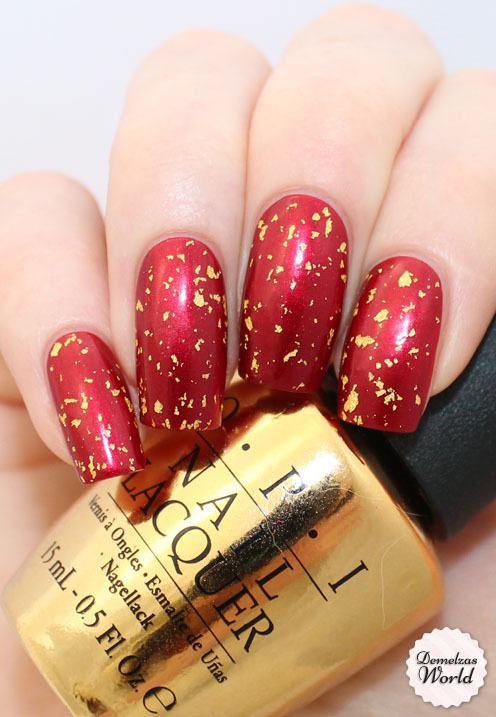 It was part of the OPI James Bond Skyfall collection from last year and it’s a real 18k golden topcoat. I’ve applied one layer over A-England – Perceval. Not only does this polish look good, the quality is amazing. I’ve applied this polish last february before I went to Berlin and 7 days later it was still on my nails and not one single chip in my nail polish! It’s the best topcoat I’ve ever used. I think they should also make this topcoat without the golden leaves! So I know there are now many other brands like Jessica and Zoya also selling a 18k topcoat, but I am still happy that I got this one. OPI still is my favorite brand (although latest collections kinda disappoint me … but that’s good for my bankaccount I guess). I love the pretty box and the gorgeous golden bottle, for me it’s a perfect addition to my OPI collection. For those who still want this polish, unfortunately it’s not available anymore. It was limited edition and sometimes you can find some on auction sites like ebay, there are always some people selling it. If you see one, get it! You won’t regret it, I promise! Yeah it really hurt my bankaccount when I bought it, but I am really happy with it 😀 There are more brands selling 18k golden leaf topcoats that are cheaper! Beautiful as always! 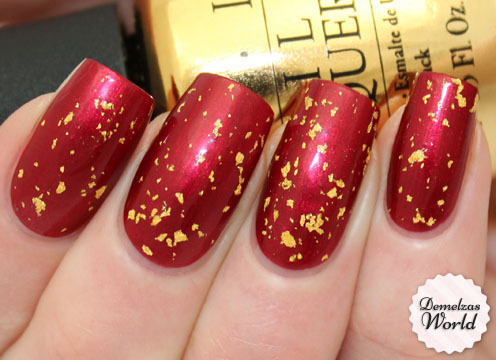 Those gold flake topcoats are spendy, but look so fun and luxe.